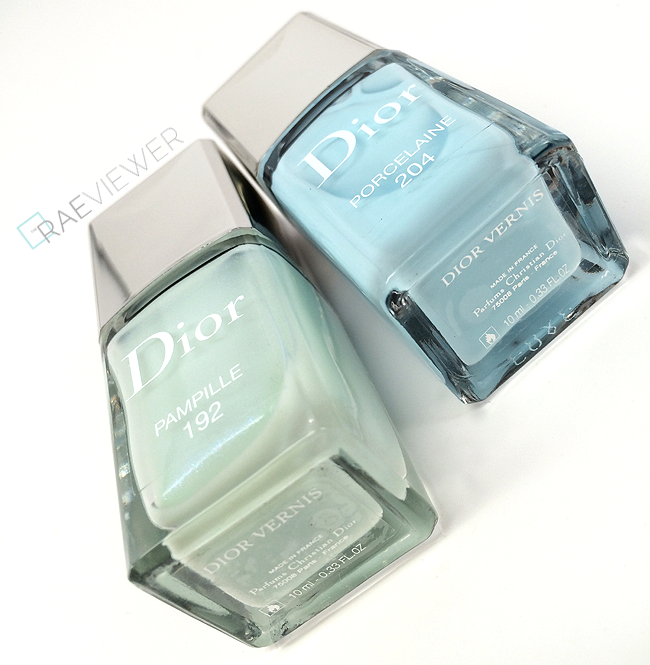 Dior's Spring 2014 'Trianon' Collection has officially launched in a few Nordstrom stores already, so I wanted to share my top two picks, Porcelaine and Pampille. The nail polishes are the only products that appealed to me, so I will only swatch the rest of the products from the collection at a later date. 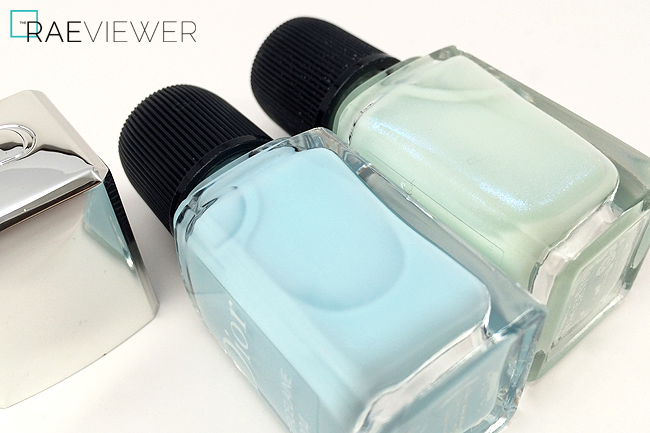 For now, let's get up close and personal with these gorgeous pastel nail polishes! I featured Pampille (192) on Instagram because I could not wait to share its beauty with everyone. It is quite sheer, but three coats resulted in a perfectly semi-translucent nail. I have a strong nail line, but it was not visible under the three layers of Pampille and shiny Butter London Hardware topcoat. 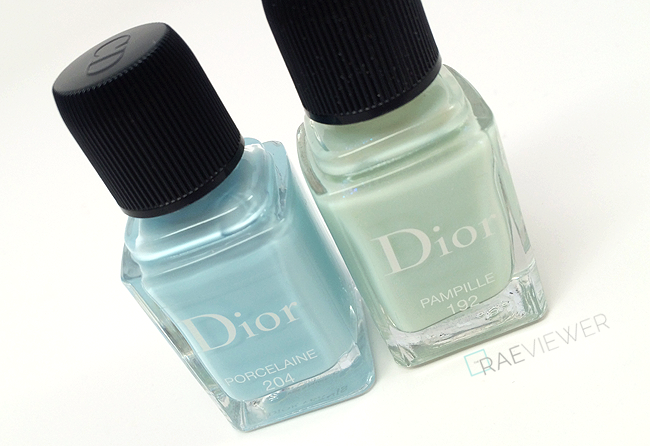 Though Pampille appears to be a mint green in the glass bottle and in the swatches on a white nail wheel, it does not translate as green on my nails. 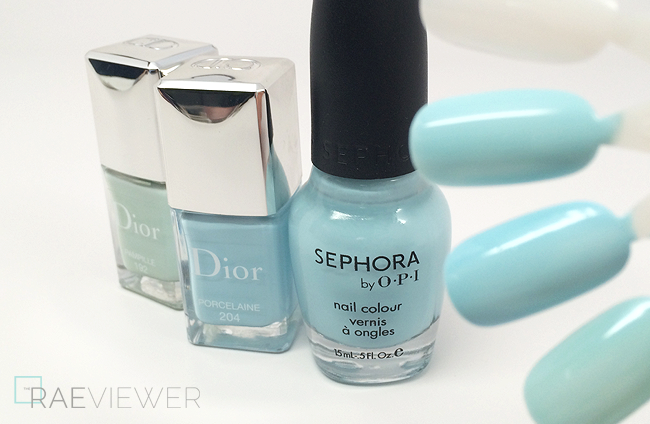 The pink in my nails highlights the blue shimmer, resulting in a milky aquamarine color. I snapped this shot in natural light but under sunlight or artificial lighting, the blue, pink, and silver microshimmer truly pop. I love how subtle and feminine Pampille looks when paired with Zoya's glittery Tomoko. I highly recommend Pampille because it can be worn as a top coat or layered to achieve that thicker gel nail polish effect. 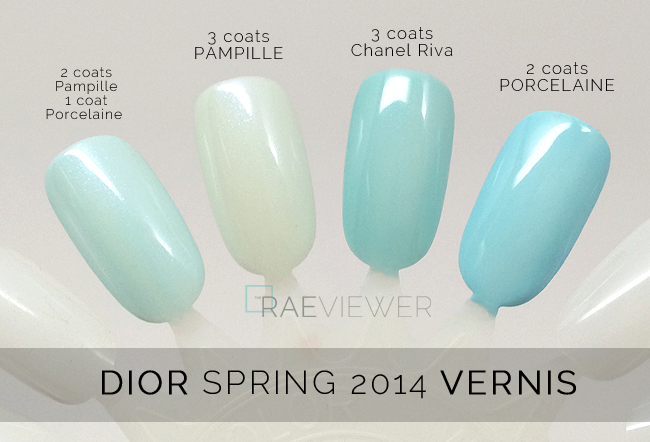 The color is smooth and self-leveling, the best Dior color I have ever encountered, and it is chip resistant. I love its versatility, and you can even alternate applications of Pampille and Porcelaine to achieve a subtly shimmering seafoam shade. In the nail swatch above, I set down one coat of Pampille, one coat of Porcelaine, and then finished with another coat of Porcelaine. I love Pampille worn any which way! It is back-up worthy. 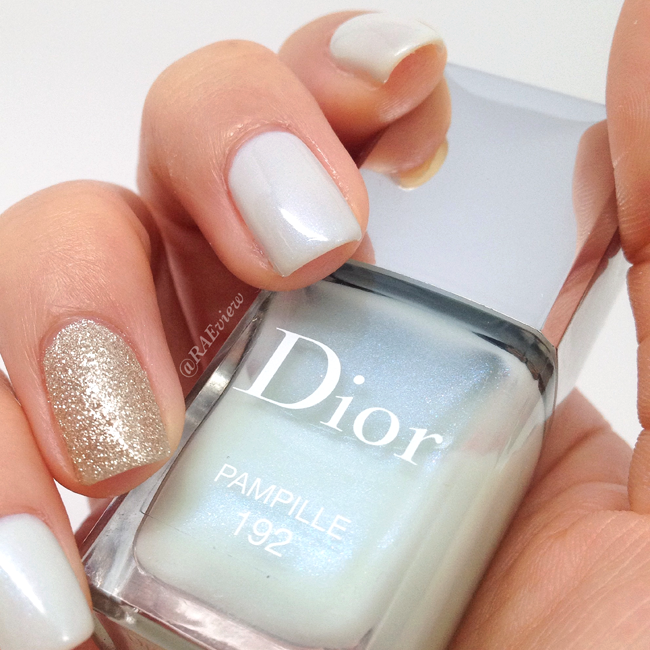 Porcelaine (204) is the best cream Dior polish in recent memory because it is not too thick or chalky. I usually prefer Chanel cream nail polishes because most Dior cream colors in the past have dried down rather chunky and/or patchy. Porcelaine, however, was very fluid. Two thin coats achieved opaque coverage, and again, I topped the color with BL's topcoat for a glossy finish. 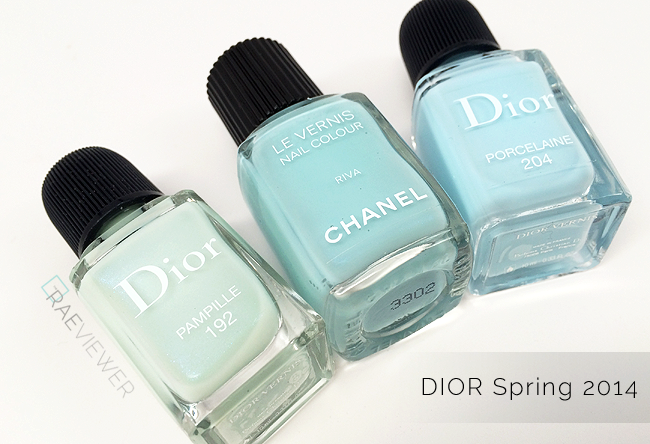 Porcelaine is the perfect sky blue. It has a cool white base, so it reads intensely, especially for a pastel. Chanel's Riva is significantly greener in comparison, while Sephora by OPI's Havana Nights is much sheerer with more yellow in the base. Both Riva & HN are discontinued. There may be similar shades to Porcelaine available, but I am blown away by the quality of this color. 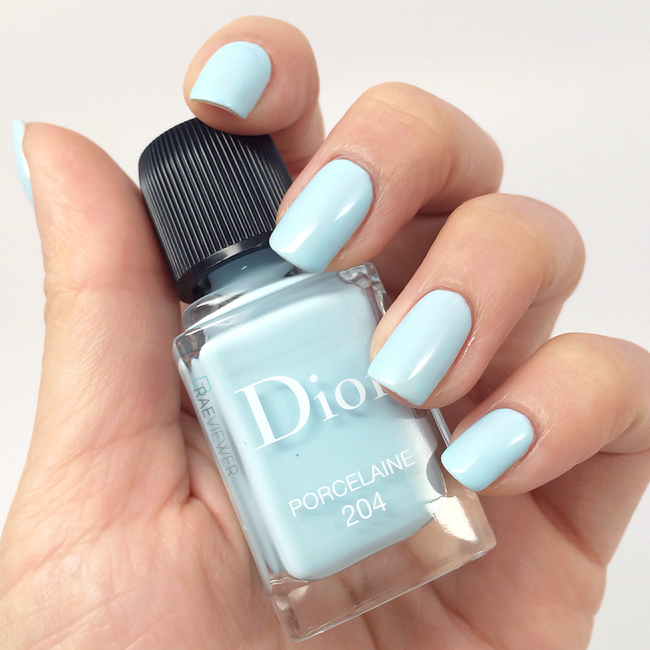 Porcelaine flows across my nails in a way that no other Dior color ever has! NOTE: On Nordstrom, the stock images for Blossom and Pampille have been mislabeled. Just keep in mind that Pampille 192 is correctly portrayed here in this post. Nordstrom has corrected the mistaken identity issue! Blossom 132 is the orange nail color. Bloom 777 is a vivid orchid pink that seems, as of now, exclusively available at Saks. I will be purchasing and reviewing Bloom as well as the sparkling pink top coat Perle 187 next week. Perle did not strike me as a must-have when I first swatched, but I would like to try it layered over Bloom. I hope the combination will yield a cheery yet softer pink, reminiscent of cherry blossoms. I love the paler blues featured today, but I always gravitate toward pinks during the spring months. I was informed by multiple Dior representatives that most counters received limited stock — as in two to five pieces of each. You can order online now at Nordstrom or Saks to ensure you do not miss out on these covetable limited editions! Bottom Line: I highly recommend both, but if you do not have the patience to apply three coats of Pampille for a gel nail effect, try the phenomenally opaque Porcelaine first! Both the colors look so amazing! Blown away! it looks a lot nicer on the fake nails than on real nails. But I do love the colors. they are so fresh and summery. Well, the nail wheel is white plastic. Real nails never look like that, so it's not a truly accurate representation! You can always buy acrylics, paint them, and glue them on to your nails. The swatch you did with the two colors layered is GORGEOUS. Must have! Also - I don't see theses colors on the Saks website. The link you included does not have the spring collection as shade options. Totally, right? It's such a beautiful soft seafoam. Saks will be receiving Bloom soon. I posted the link despite the fact since Saks will "apparently" receive the stock for that color exclusively. The other colors are available only available on Nordstrom right now, early preview. I am getting married in August and blue is the color theme of my wedding. I can't wait to try these new colors and see if they work for my nails for my wedding. Thanks for the post! I have seriously considered pre-painting my swatch wheels in lifelike colors.